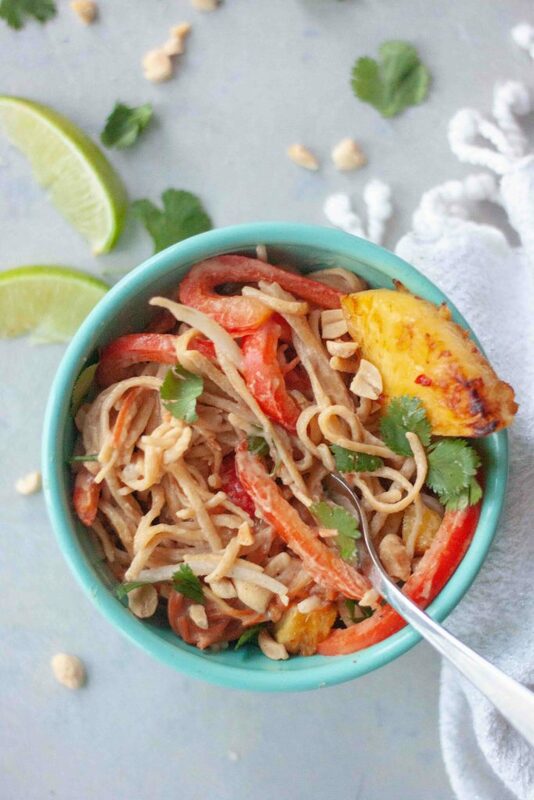 It might be cold outside, like sub zero temps cold, but things are heating up for dinner with Pineapple Pad Thai! I cannot get enough citrus and tropical fruits right now. We’re talking eating 1/2 a pineapple, or 8 clementines in a day. Not to mention mango and grapefruit but pineapple and Cuties are always in the house lately. I was out running errands and got hungry and even stopped to pick up a 5lb back of clementines to satisfy my cravings. I always like fruit but eating and craving it a lot more with the pregnancy. 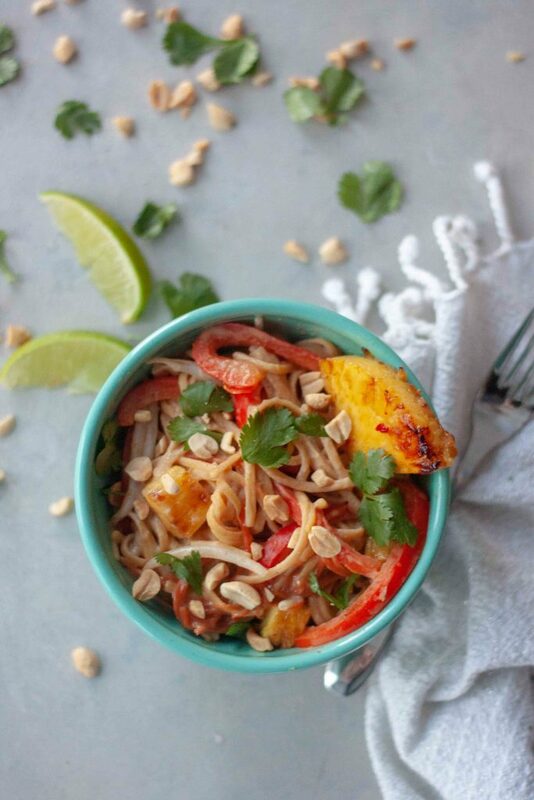 When a craving for Pad Thai hit one night I decided I had to add pineapple, but not just fresh pineapple I decided to go for the sweet grilled/roasted taste and add a little something extra with sweet chili sauce. I may have even eaten all of it while prepping other veggies for the Pad Thai and had to make more. Oops! I will say my Pad Thai is not like a traditional Pad Thai and I like to use peanut butter but you could also sub almond butter if you need to. Pretty much a version of the sauce I use in my Spaghetti Squash Pad Thai, a favorite and most viewed recipe, cleaned up a little. Seriously the combo was love at first bite. When my husband was on board and loved it too I knew I had a winner! Trust me he is the one that keeps what I post balanced and in control so you don’t see some very odd, in my families opinion, combos. So I just share these on Instagram Stories from time to time but really there aren’t too many and they aren’t that crazy if you ask me. So good I had to make it again, and again, and share it with you! I also decided to whip it up this time with Banza noodles (they’re chickpea based and gluten free) instead of rice noodles for added protein. You can use either I’ve been doing both depending on my mood, what we have, and what my body needs. 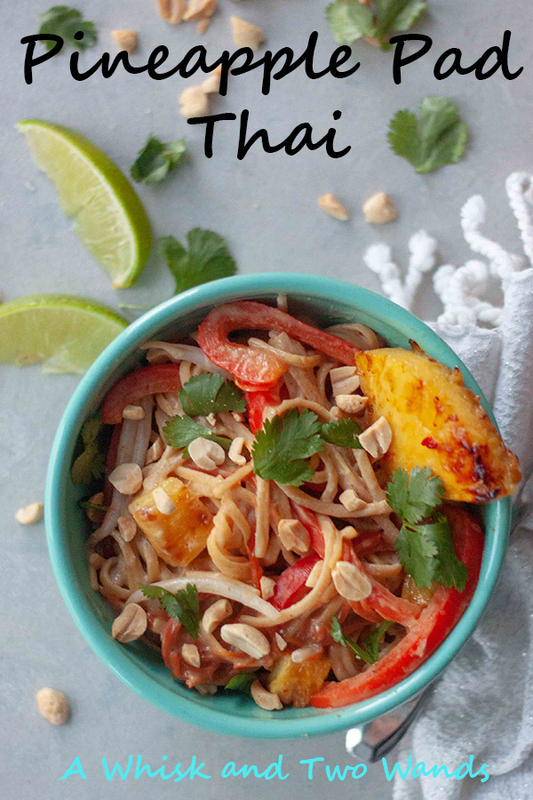 Perfect for Meatless Monday or when you’re craving Pad Thai or comfort food as it’s simple to make and healthier than take-out. Speaking of Meatless Monday I hope you link up with Deborah and I and share what’s been happening in your kitchen and one or more of the recipes linked up below inspires you. 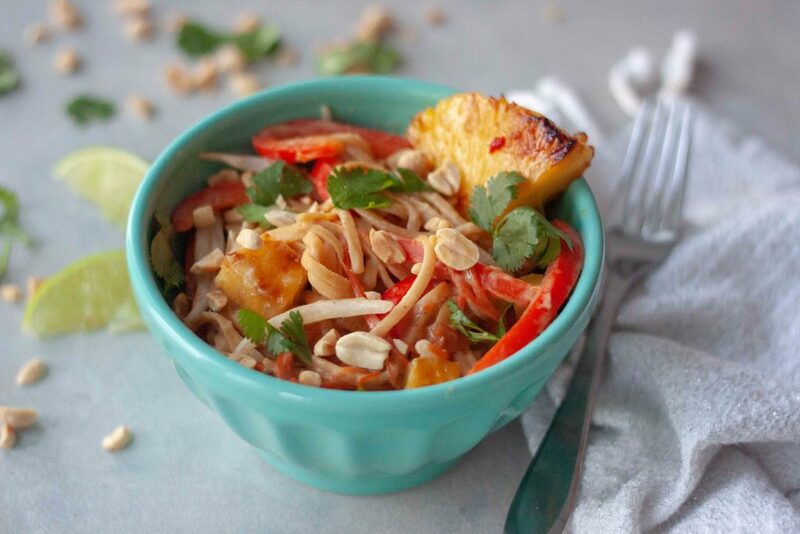 Simple Pad Thai with caramelized sweet chili pineapple will have your taste buds dancing. Cleaned up and option to use protein noodles. Vegan and gluten free friendly. Start a large pot of water, brining to a boil, to cook your noodles. Cut pineapple into slices about 1/2" thick and remove skin. Heat a cast iron pan over medium high with just enough coconut oil to coat the bottom of the pan. Brush pineapple slices with 2 tablespoons of sweet chili sauce (reserving the rest for the Pad Thai sauce) and place in hot cast iron pan. Cook for 1-2 minutes until they brown and look caramelized. Brush tops with sweet chili sauce if you haven't already and flip slices cooking for an additional 1-2 minutes. Remove pineapple pan from heat and set aside while you prepare the rest of the dish. Once cooled chop into bite size pieces, reserving one slice to cut into wedges for garnish if desired, working around the core and discarding if desired. The core is soft and you can eat it if you want to chop that up as well. When your pot of water is boiling add noodles, you will want to time it so your noodles are done when sauce is ready so if less than 5 minutes cook time wait and start when you start cooking the veggies. Cooking noodles according to package instructions for the noodles used. In a large skillet, or rinse out your large cast iron pan. Heat sesame oil over medium to medium high heat. Add in garlic and ginger, sauté for 30 seconds. Making sure the heat isn't too high you burn it. Add in red peppers, carrots, and beat sprouts, cook for 2-3 minutes. Stir in peanut butter, aminos, water, chili sauce, and palm sugar. Once mixture comes together add cooked and drained noodles and toss to coat. Plate and top with cilantro, peanuts, pineapple and lime wedges. Serve with additional sweet chili sauce and aminos for topping as desired. Here too! Thank you, and we’re trying hard to stay warm. It’s been a long time since I’ve made or I guess even eaten pad thai! This looks yummy! 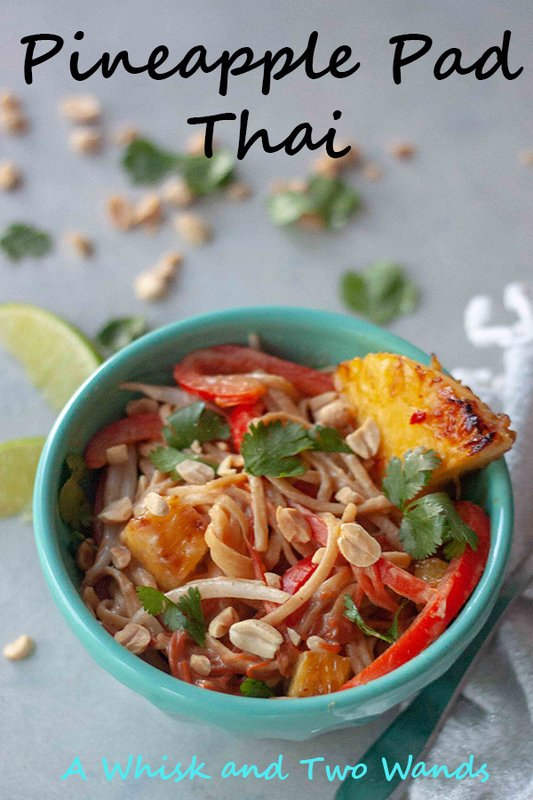 I can’t wait to try this Pad Thai recipe. It looks absolutely delicious. I loooooove the taste of cooked pineapple in stir frys! Cooked pineapple, well pineapple in general, is so delicious! It adds the perfect pinch of sweetness.